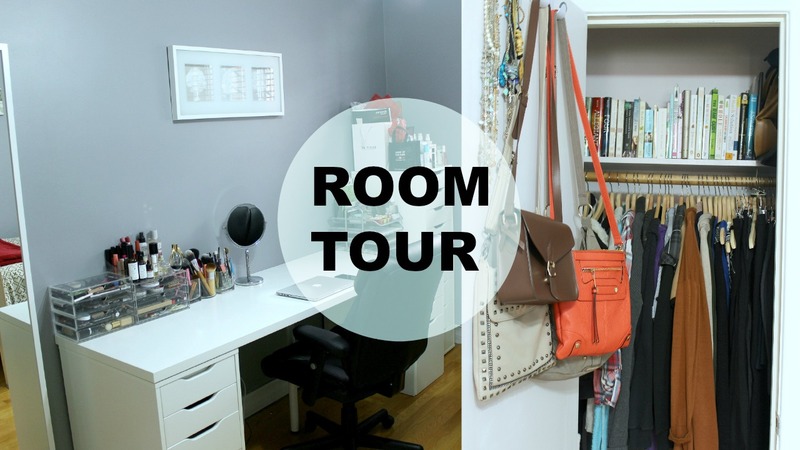 Room Tour | Office Organization, Makeup Storage + Tips to Make a Small Room Look Bigger! Well, the day has finally come. 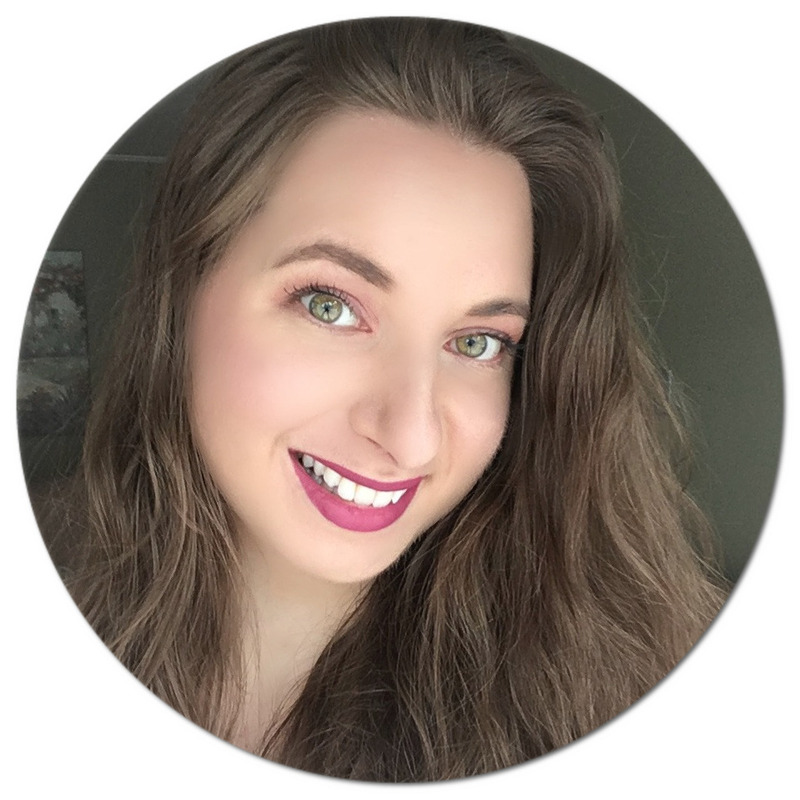 My room was in need of a major makeover, and although I did not document the before (you can still catch glimpses of my obnoxiously bright yellow room in some of my older videos), I decided to share my new space with you. This time around I opted for decor that gives off a simplistic and modern vibe, going with a grey and white colour scheme which I think represents my style a lot better. I envisioned a space that would inspire me and get my creative juices flowing and I'm happy to share that I have finally achieved that. I now spend most of my time here, working on my blog and videos or to just simply relax and get my mind off of things. 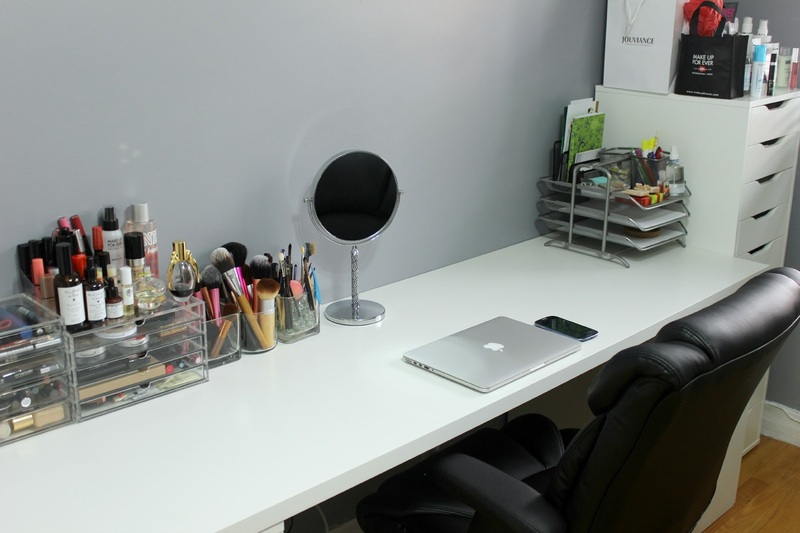 In the video, I take you on a room tour of my personal office and beauty space and show you what I use when it comes to organizing tons of products, clothing and accessories. Living in the city and being the youngest in the family, I did not get much say when it came to picking my room when we moved into our house nearly 15 years ago so of course I was left with the smallest bedroom. I used to have bulky furniture and lots of it, which did not help the cause. With my latest makeover however, I feel I have figured out how to make my small bedroom actually look spacious. 1- Set up a double purpose office area. In my case, this was dividing my desk into both a work space and makeup vanity. I set up a table top on two separate units, since this creates the illusion of an elongated wall, therefore a bigger room. I built my own desk by placing this very wide white LINNMON Table top on top of an ALEX 4-drawer unit and ALEX 5-drawer unit, all three from IKEA. 2- Get a large mirror. Again, this opens up a small room and makes it look more spacious. I opted for the STAVE mirror in white from IKEA, which you can hang either way. I opted to have it stand vertically since I enjoy seeing how my outfits look from a distance. 3- Do not overdo it with decor. This was my biggest mistake with my previous room. I kept way too many knick knacks scattered a bit everywhere which did not remedy the small bedroom situation. 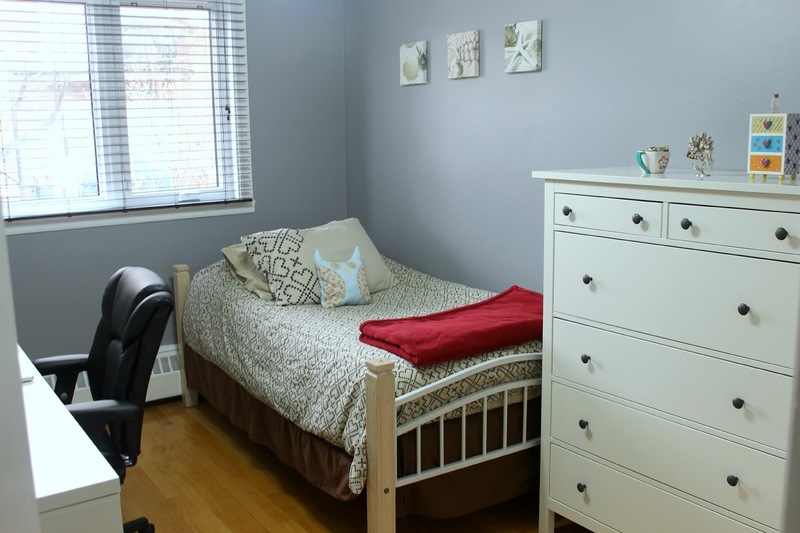 The cleaner and less cluttered you keep your small bedroom, the more spacious it will appear. 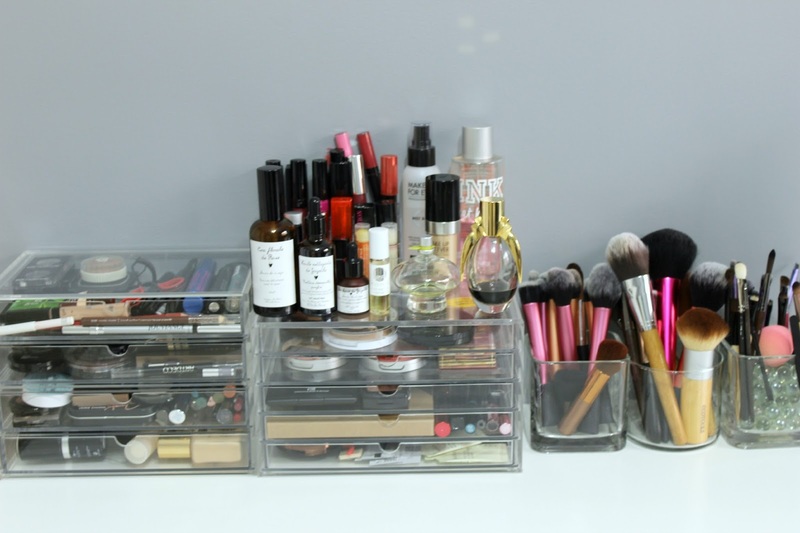 I personally enjoy the look of my DIY brush holders and these MUJI acrylic cases in which I store my makeup, as well as my DOKUMENT Letter tray and Magazine files from IKEA which hold office supplies and papers I want to keep handy. I also hung this ERISLUND Picture above my desk which adds to the simplicity of my room. 4- Storage units are key. This time around, I purchased pieces that I knew could hold a lot of stuff. Being a beauty blogger means I accumulate a ridiculous amount of products, and since I film in my bedroom I also wanted storage units that still look aesthetically pleasing. I personally find that white furniture makes a room look bigger (you can probably tell I'm a fan by scrolling through my For the Home Pinterest board). On top of the above mentioned desk units, I was also able to squeeze this ALEX 9-drawer unit from IKEA in the corner of my room. It might look small but it can store a lot of stuff. 5- Small closet? No problem! Tying in with my previous tips, if you have a tiny closet like I do, invest in a chest of drawers that is tall rather than wide. I own this HEMNES 6-drawer white stain chest from (you guessed it!) IKEA and it holds the majority of my clothes - it's seriously amazing. And there you have it: a glimpse into my living space. What do you think of my new room? If you have any 'making a small room look bigger tips', do share below! Thank for the tips! I know how to decor my room now. I should get a bigger mirror. Thank you for the tips,.. 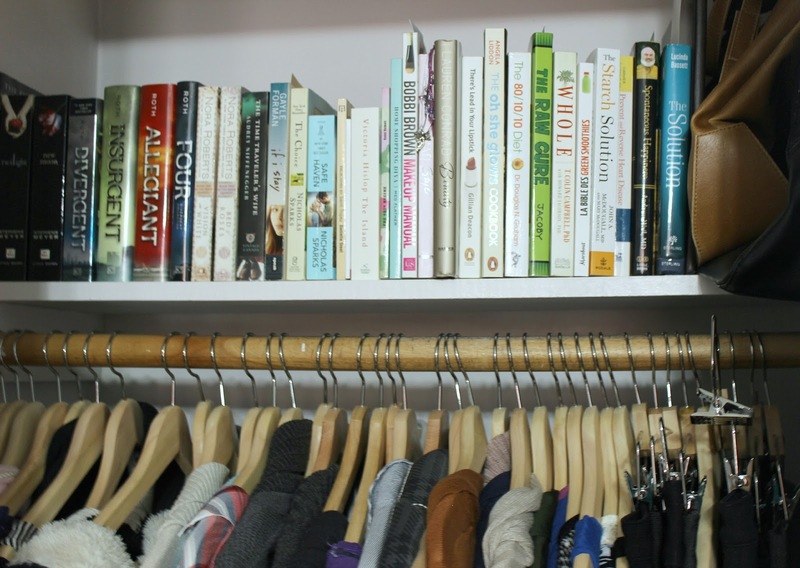 I need to get some storage units... Lovely post,..
Great tips Natalie! I think that I need some storage units!